Remagen is the perfect setting for this bike tour in Germany. 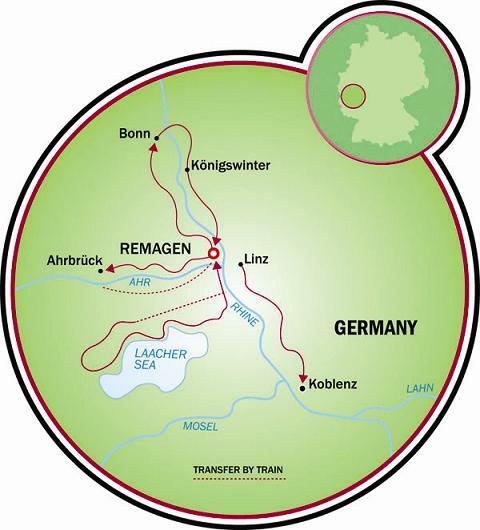 With both the Rhine and Ahr Rivers close by, Remagen offers a wide range of cycling routes to choose from, including to Koblenz (where you'll run into the Mosel) and through the valley's wine region. Processions of boats frequently promenade on the rivers, and remnants remain of Remagen's famous Ludendorff Bridge, which was so famously crossed by U.S. troops during WWII. And don't miss wine-tasting some Burgundy wines in the fortified town of Ahrweiler, where Germany's oldest wine producers started. Want to spice up your bike tour with other activities? Ask your hotel reception about train excursions, check to see if there are any wine festivals scheduled during your stay, explore the region ever more with a day trip by train or boat to Cologne, Rudesheim, or Cochem. …. 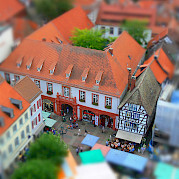 Be sure to browse all of our bike tours in Germany! Train from Frankfurt airport to Remagen via Koblenz, ± 1½-2 hr. at approx. €30. Average high temp in °F for Remagen is 57 in Apr; 66 May; 71 Jun; 74 Jul; 73 Aug; 68 Sep & 57 Oct. In a family-owned and operated hotel located in the town center of Remagen opposite the train station. All rooms have private facilities. The hotel also has a café with a terrace, a bar, wine cellar, beer garden, and evening entertainment. Extra nights in Remagen available by request (with bike rental possible). Easy self-guided based tour along the flatlands of the Rhine valley on peaceful bike paths. Daily distances according to preference. This bicycle tour in Germany consists of many different routes for you to choose from; the ones listed below are some good examples. 1. Arrival in Remagen; welcome glass of wine. 2. Rhine Trail: Koblenz – Leubsdorf – Linz, 16-30 mi. 3. Bike & Train: the Vulkan Express, 30 mi. 4. Ahr Valley, 40 mi. Train & Bike, 20 mi. 5. Vinxtbachtal Valley, 28 mi. Departure. 3. Bike & Boat, 30 mi. 5. Bike & Train, 30 mi. 6. Seven Hills: Bonn – Königswinter – Erpel, 16-30 mi. 7. Vinxtbachtal Valley, 28 mi. Arrival at the hotel in Remagen, where you will be greeted with a welcoming glass of wine. The morning you will have to your leisure to visit the Apollinaris pilgrim church and the famous Remagen Bridge. The afternoon will consist of a ride along the flat Rhine River (Rhine Trail) in the direction of Koblenz, while cycling through the Rhine’s wine region and visiting the wine village of Leubsdorf and the medieval town of Linz along the way. Today will start on the Vulkan Express diesel/steam train into the Eifel hills from which you’ll make your way back to Remagen. The Burgundy Valley of the Ahr River will be extensively explored on this day, with the option of returning from Ahrweiler via Kirchdaun for those seeking a hillier and more challenging landscape. The bike trails will offer spectacular views as well as some wine tasting stops. Another option is to take the train from Remagen to Ahrbrück and returning along the Ahr and Rhine Rivers back to Remagen by bicycle. An optional Sunset Cruise will round off the day (June to September). 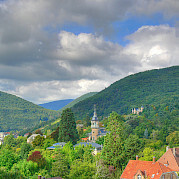 Charming villages line today’s route through the beautiful and tucked-away valley of Vinxtbachtal. Arrival at Hotel Pinger in Remagen, where you will be greeted with a welcoming glass of wine. The morning you will have to your leisure to visit the Apollinaris pilgrim church and the famous Remagen Bridge. The afternoon will consist of a ride along the flat Rhine River (Rhine Trail) in the direction of Koblenz, while cycling Germany through the Rhine’s wine region and visiting the wine village of Leubsdorf and the medieval town of Linz along the way. The evening offers the option of a free guided walking tour through Remagen. Today will start with some cycling along the river’s banks to Koblenz and the ‘German Corner’, by which the Rhine and Mosel Rivers conjoin. The return trip will consist of a leisure boat ride. In the evening you can take part in some Beer Tasting in the wine cellar of Pinger Hotel with one of the hosts. The Burgundy Valley of the Ahr River will be extensively explored on this day, with the option of returning from Ahrweiler via Kirchdaun for those seeking a hillier and more challenging landscape. The bike trails will offer spectacular views as well as some wine tasting in Germany’s oldest wine growing region and the fortified city of Ahrweiler. Another option is to take the train from Remagen to Ahrbrück and returning along the Ahr and Rhine Rivers back to Remagen by bicycle. An optional Sunset Cruise will round off the day (June to September). Today will start on the Vulkan Express diesel/steam train into the Eifel hills from which you’ll continue by bicycle to crater lake and the Abbey of Maria Laach on your way back to Remagen. Today we’ll head north cycling along the left bank of the Rhine via Oberwinter and Rolandseck, where the legendary Rolands Arch can be visited. 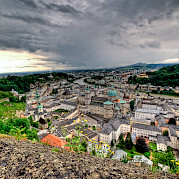 Continuing on will be Godesberg before finally reaching Beethoven’s beloved birthplace, Bonn. The return trek can be taken by boat or by bicycle cycling back along the right bank of the Rhine via Königswinter (where the Drachenfels Castle and ruins can be found), Rhöndorf (where you can visit the Adenauer House), and the wine villages of Unkel and Erpel. In the evening, one of the hosts at Pinger Hotel will offer wine tasting in the wine cellar. 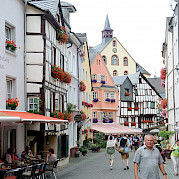 Enjoy a last walk through Remagen’s romantic streets before departure. This tour is run by Leonard Pinger. 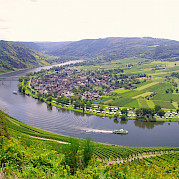 I highly recommend combining this tour with the Mosel River tour. They are both wonderful bike tours, but they are also quite different and fun to compare & contrast. Whereas the Mosel River tour is a progressive tour with overnights in a different town/hotel each day, the Remagen: Rhine Valley tour is based out of a single hotel with interesting & beautiful side trips for each day's itinerary. If you arrive in Remagen by train (highly recommended) you are literally a few footsteps away from your hotel. This is convenient for your arrival & departure as well as for a couple of the side trips. The train serves both the Rhine Valley and the Ahr Valley. They are both great for bicycle tours, but the Ahr Valley is an absolute must. 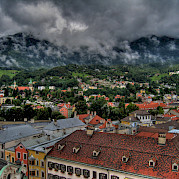 It is so calm & peaceful yet filled with incredible scenic, historic & gastronomic stops. The owner of your hotel also serves as your tour-guide if you visit the Ahr Valley wine museum. And the Ahr Valley bike path is Read more… one of Germany's greatest hidden gems. One of the most fascinating surprises on this tour was the little medieval villages found in the region. My two favorites were Linz & Urpel. Both of these villages are directly across the Rhine River form Remagen and easily accessible via ferry and biking or walking. And of course it goes without saying that Remagen is full of historical significance from medieval times all the way up to and beyond World War II. For peaceful, scenic & historical bicycle exploration, you can't go wrong with this lovely tour. September 2014...Arrived Frankfurt from Australia and caught train to Remagen. The walk from the station to the hotel took all of 30 seconds....the delightful receptionist had us booked into our room within a few minutes. Rooms were 10/10. Meals throughout our 7 day stay were all satisfying and scrumptious. Rental cycles albeit a bit on the heavy side were most reliable and well geared..and we should know as we rode up most of the cycle paths which the provided cycle maps suggested we ride down. One of the highlights was the Remagen Wine Queen celebrations held over the weekend in the Alstdt...plenty of wine beer food singing and dancing. Our weeks stay was so enjoyable we are going back in 2015.